Most of our vehicles run either on gas or diesel, and we do have a fair idea of the differences between the two fuels, at least the main ones, which we confront in our daily lives. We all know that diesel gives us better mileage than gas. 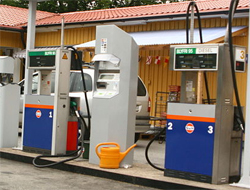 We are also aware that a gas or petrol engine is nippier, and is a lot less noisy. A diesel engine on the other hand has more torque and therefore suitable for large vehicles. The exhaust spewed by a diesel engine is far more polluting than that of a gas engine and it is the most well known of all the differences. The above is the layman’s view, and while largely true a lot has changed with improved diesel technology, with the gap between the two closing. To get down to the intrinsic differences between the two we have to turn to science. Both diesel and gasoline are refined from crude oil, but their basic molecular structure varies greatly, on account of their having been derived at different temperatures. A major difference between the two fuels is the way in which the two are burned in an automobile engine, so as to provide power to your vehicle. Cars that consume gas use spark plugs to ignite the fuel on account of the low compression ratio of the engine. Diesel engines on the other hand have a higher compression ratio and therefore generate enough heat, so as not to need spark plugs to ignite the air and fuel mixture present in the engine. A gasoline engine requires an electric coil, distributor, and an alternator apart from the spark plug in order to be functional. A diesel engine on the other hand has no need for any electric system, except when it needs battery power to start up. To get very technical about the difference between the two types of fuel, gasoline is comprised of isooctane or 2, 2, 4-trimethylpentane. Diesel on the other hand is an amalgamation of hydrocarbons mainly in the C9H2O to C12H26 range. The gasoline versus diesel debate is a very old one, and both fuels have their loyal votaries. But things have settled down a bit, now with both fuels being very economically and efficiently consumed in modern fuel efficient engines. However the consensus is that for city driving a gasoline engine is good, while a diesel powered vehicle is just right for the long haul- heavy duty stuff. 1.Diesel gives better mileage than gas. 2.Gas run engines more nippy, diesel run ones have more torque. 3.Diesel engines more polluting than gas ones. 4.Gas run engines need spark plugs, diesel run ones do not. 5.Gas run engine needs electrical support, while a diesel run engine needs marginal electrical support. 6.Gasoline comprised of isooctane or 2, 2, 4-trimethylpentane. Diesel on the other hand is an amalgamation of hydrocarbons, in the C9H2O toC12H26 range. Manisha Kumar. "Difference Between Gas and Diesel." DifferenceBetween.net. October 1, 2009 < http://www.differencebetween.net/technology/difference-between-gas-and-diesel/ >.